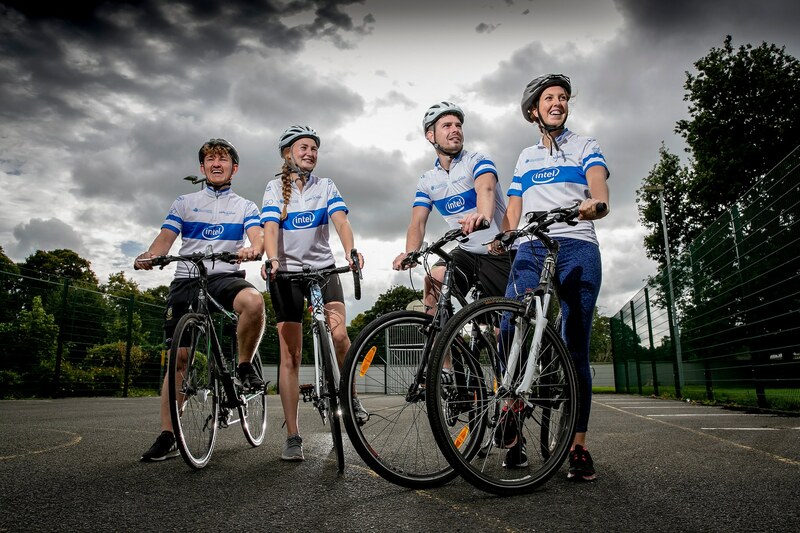 Intel employees take to their bikes and raise €16,000 for charity! 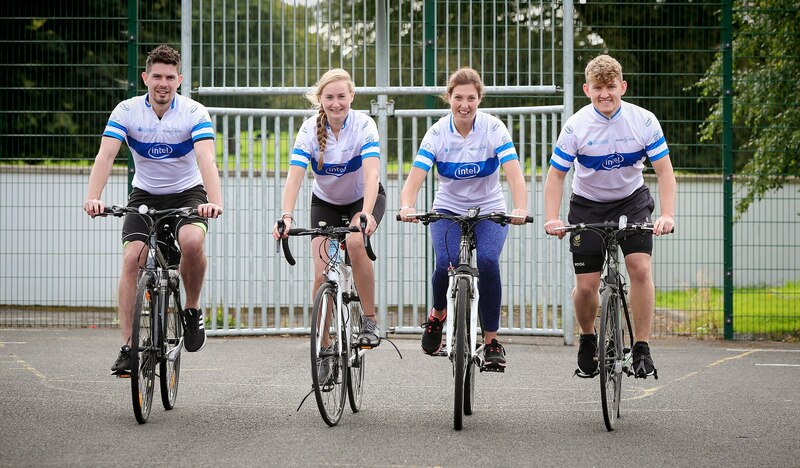 In its ninth year, Intel Ireland hosted their annual Charity Cycle on Friday 7th September 2018. All money raised by the event will go towards Intel’s signature charities – The Alzheimer Society of Ireland and Make-a-Wish Ireland. Each year, Intel Ireland selects two signature charities – giving all at Intel the opportunity to centralise their efforts by offering volunteer time and in turn, the charities will receive donated funds. For 2018, Intel Ireland choose The Alzheimer Society or Ireland and Make a Wish Ireland. And over the course of the year Intel hosted a number of events such as a Lip Sync Battle, Colour Run and a Bake Sale. In the annual Charity Cycle, participating employees took on the challenge of tackling routes of either 50KM, 80KM or 160KM. Early morning, 7:30am, those cycling the 160KM route left, with the 80KM and 50KM cyclists leaving shortly after. 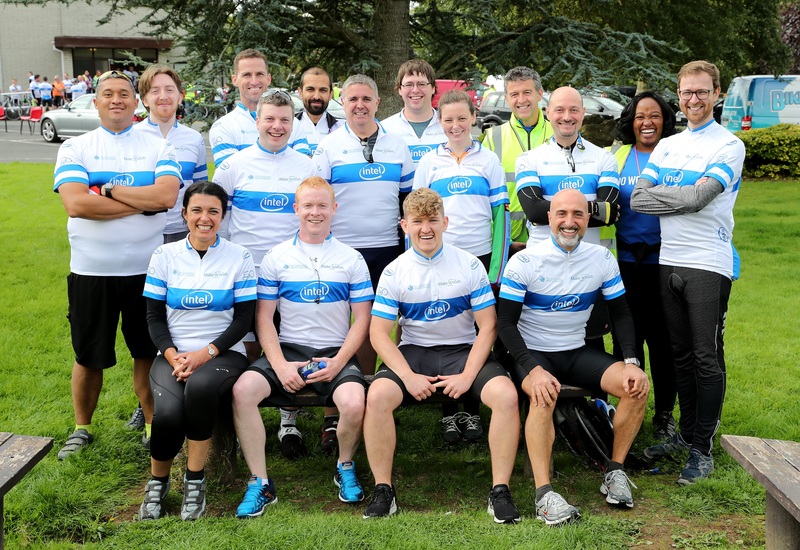 Employees left the Intel Ireland campus in Leixlip before taking on various parts of Kildare, Meath and Wicklow. Each of the routes factored in a lunch at Summerhill Community Centre in Co. Meath – were staff welcomed Intel cyclists and crew. During the well-deserved lunch, employees got the chance to hear from both Signature Charities, reminding Intel and its employees why they are carrying out their good work and the positive impact both Intel and the charities are having. Employees, in their memorable blue jerseys set off for the final stretch of the challenge, passing through villages such as Kilcock and Moynalvey. Both cyclists and volunteers were lucky with the weather, with the rain staying away for the duration of the event. 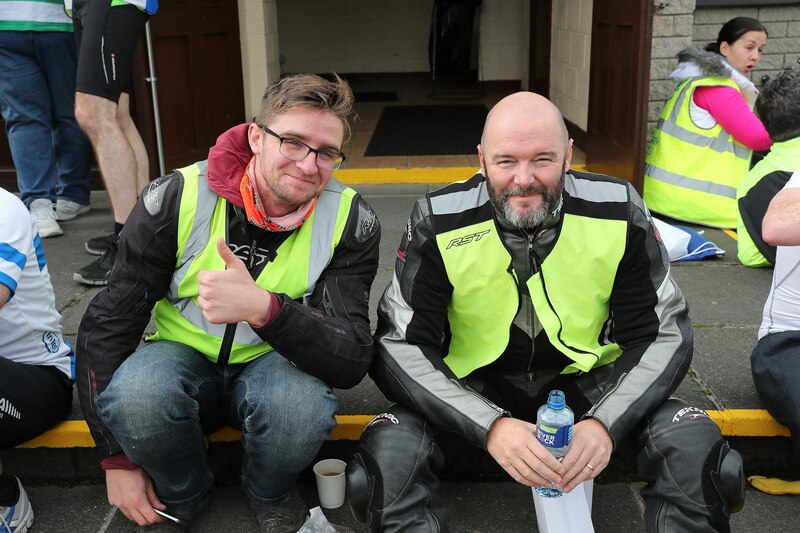 In total, 200 employees took part in the event, either as a cyclist or a marshal taking to the roads to offer support and ensure the safety of the event. As per previous years, there was an overwhelming positive response to the event, with €16,000 raised for the signature charities. The total amount of monies raised by Intel’s charitable events will be donated to both signature charities. Intel employees, Eoin Brady, Ruth Quinn, Martin Conroy and Lisa Sherin are among the 165 cyclists who took part in the event. 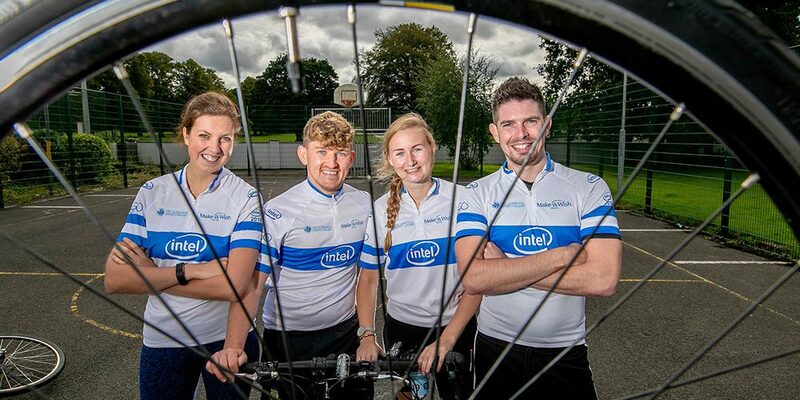 Intel employees, Lisa Sherin, Eoin Brady, Ruth Quinn, and Martin Conroy are among the 165 cyclists who took part in the event. Please find additional photos from the day here. The Alzheimer Society of Ireland the leading dementia specific service provided in Ireland, a national non-profit organisation. The charity is person centred, rights based and grassroots led with the voice of the person with dementia at its core. They currently have 15 branches delivering 120 dementia specific services such as day care centres, home care centres and care support groups. Their vision is to have Ireland were no one goes through dementia alone and were policies and services respond appropriately to the person with dementia. Make-A-Wish Ireland is an affiliate of the international Make-A-Wish family. Arriving in 2002, Make-A-Wish Ireland has one simple aim – to grant the wishes of children aged between 3 and 17 years living with life-threatening medical conditions to enrich the human experience with hope, strength and joy. As it stands, Make-a-Wish has granted over 2,000 wishes to brave children across Ireland. As a well-respected and popular children’s charity, Make-a-Wish are fully committed to providing the maximum level of care and enjoyment for children and even more importantly the inclusion of each child’s family to provide long lasting memories to last a lifetime.